Even with a strong wind, the range ring is a perfect circle. I found an interesting error in Flying Magazine today, in which the author described an airplane’s range as being “anywhere from a perfect circle to an egg shape based on the wind conditions.” Wrong! Remember, one should think in the most simple terms about the effect of wind on an airplane. Wind is just motion of the air. After an airplane leaves the ground during takeoff, it experiences no relative influence from a steady wind because the airplane is flying into the air in a manner that is constant relative to that air. From any given point in the air mass, the airplane’s range is a perfect circle within that mass. Wind is important in flight, of course, because it modifies the ground track and speed relative to the Earth’s surface. This changes fuel requirements, and ultimately the cost and efficiency of flight between points on the surface. But what the wind does not do is create “eggs” or “semi-oval shapes”. 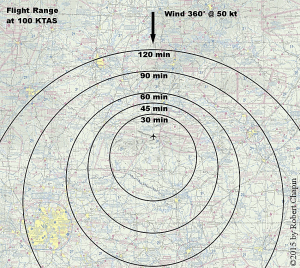 When the wind is calm, the range circle in the air mass is identical on the ground. 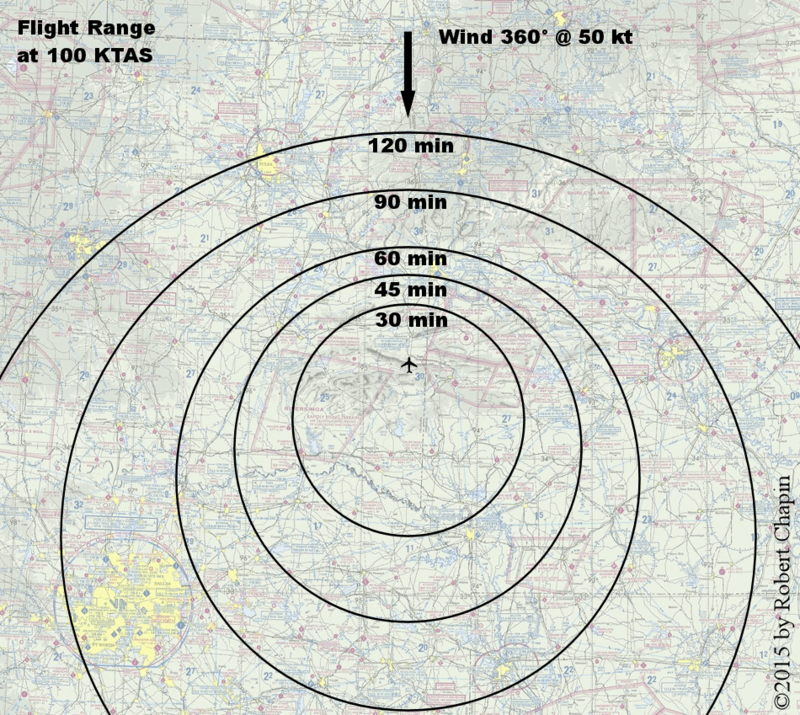 When the wind is 20 kt, the center of the range circle moves 20 NM away from the airplane’s initial position on the surface for each one hour of flight. The slight asymmetry of two or more range circles is created by the fact that concentric “range rings” will be centered in different positions on the surface. As described above, if a 1-hour range ring is offset by 20 NM, then a 2-hour range ring must be offset by 40 NM, and so on. When these range rings are plotted simultaneously, they give a slight illusion of being oblong, when in fact they are still perfectly circular. If that explanation is too simple, you can verify the wind calculations using some basic high school trigonometry. The best tool available for pilots to quantify overall flight risk is the form found in the FAA’s Personal and Weather Risk Assessment Guide. However, that form is more than 10 years old and needs many improvements. It is based on the “PAVE” method or checklist, and enables a pilot to assign a predetermined point value to each area of risk. This helps to minimize subjectivity and encourages detailed preflight planning. Using this process in connection with Aeronautical Decision Making is a great idea, but I want to illustrate several ways to make it more complete and hopefully more accurate.